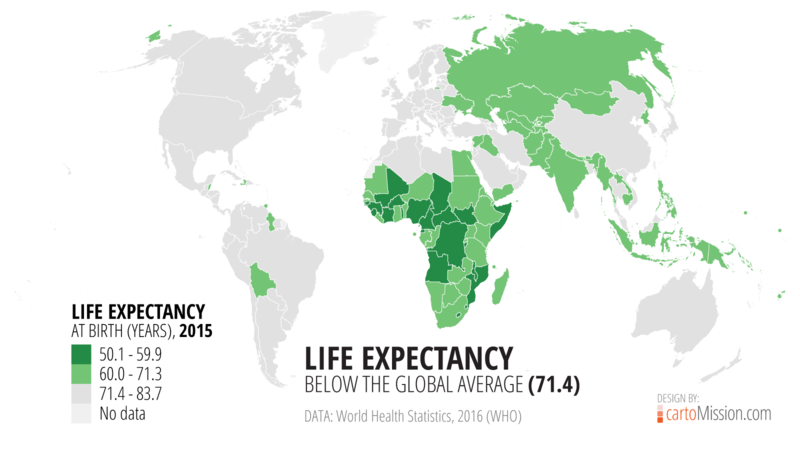 This map highlights the countries with life expectancies below the global average of 71.4 years in 2015. Of the 183 countries with data reported by the World Health Organization (WHO), there are 80 that fall below the global average. Forty-seven of these 80 countries are in Africa, followed by Asia (21), Latin America and the Caribbean (5), Oceania (5), and Europe (2). There are 22 countries with life expectancies at or below 60 years, all located in Sub-Saharan Africa.